We design, specify, provide & install data center power & cooling infrastructure systems. Learn about some of the projects we’ve been fortunate enough to be involved in below. Obras Sociales del Santo Hermano Pedro, the Sanctuary of Humanity, was founded over 30 years ago in Guatemala to follow in the footsteps of Saint Hermano Pedro in the care and service of the poor and sick. The hospital has been renovated to create space for medical care of children and adults with chronic diseases who might otherwise be abandoned. In Mission Critical Facilities International’s tradition of care and community service, we have donated a much-needed generator to the effort so that caregivers are better able to help the sick and dependent live healthier, more fruitful lives. It means so much to our teams that we’re able not only to fulfill the needs of economically important businesses all over the globe, but that also we have the chance to try to make an impact on the lives of people a world away. In the age of information technology, it’s heartwarming to know that our power and cooling systems can enable humanitarian efforts to maximize the amount of care they can give to men, women, and children who need it. Greetings from all of us who are part of the Obras Sociales del Santo Hermano Pedro, Sanctuary of Humanity family. On behalf of our 250 residents in Virgen del Socorro, the Franciscan fraternity and the maintenance team, we would like to thank you deeply for continuing to show us your faithful generosity and friendship by supporting us with an electric generator, for facilitating the installation of the generator, and for providing tools to our maintenance department. The ongoing help and love from benefactors like you make it possible for us to maintain humanitarian work and strengthen ourselves and our efforts day after day. May you and your families continue to be blessed in abundance. 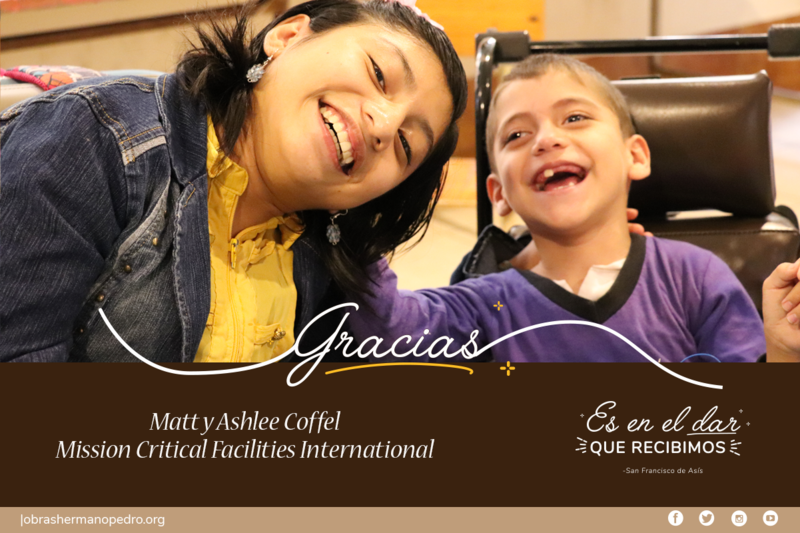 We are eternally grateful for the positivity we have received from the hard workers in Guatemala and will continue to provide equipment and services to keep the dream of love and hope alive at Obras Sociales del Santo Hermano Pedro. There are few charitable efforts as far-reaching and heartfelt as the Community First! Village in Austin, Texas. Created & sponsored by Mobile Loaves & Fishes, it’s a community of formerly homeless men and women built on 51 acres to give the less fortunate a second chance. The community offers food and medical care as well as leisure time activities within the construct of affordable housing. Counselors and professionals offer career and mental health support, and residents are given the opportunity to turn their lives around by taking advantage of the community’s offerings to build a rich, fulfilling working and home life. Mission Critical Facilities International Believes in Community First! The Mission Critical team visits the Community First! Village often and lends a hand wherever hands are needed. 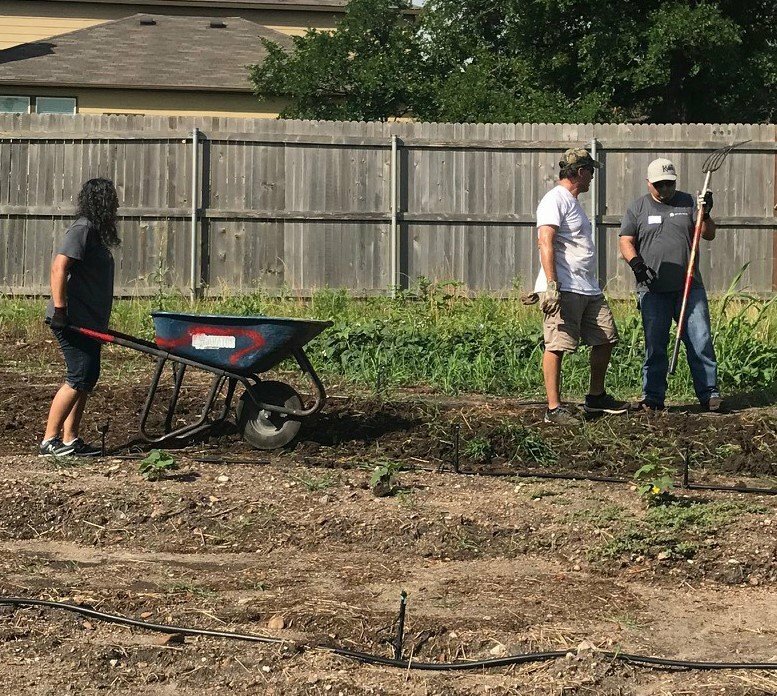 On June 9, 2018, the crew came by to give the gardens and yards some well-needed care – fortunately, we know the rigors of backbreaking work very well, and our previous experience helping out on the grounds allowed us to captain our efforts confidently. The community needs the gardens to ensure they can provide enough food for everyone on a regular basis while still maintaining and upgrading their available facilities and services. We were, of course, more than happy to help bring more nutritious food to those in need! Our helping hands also pulled weeds from the residents’ yards so they could feel more proud of their homes. We hope to inspire more people to make profound improvements in their lives by building their sense of confidence and self-worth. It won’t be our last visit; the team loves working with Community First! every time we get together to help. It doesn’t just build our sense of camaraderie – it also helps us integrate into the local community and give back to a city that has given us so much. Join us next time we head out – an extra pair of hands or two goes a long, long way! 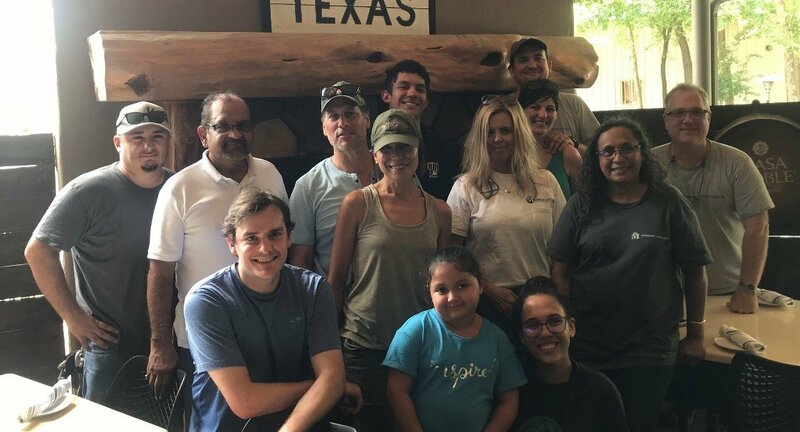 As an Austin, Texas-based company, our team always appreciates the chance to work with non-profit organizations in our city. Community First! Village is one of our favorite places to volunteer. This master planned community, which is part of the Mobile Loaves & Fishes program, provides affordable housing for the disabled and chronically homeless on 27 beautiful acres. Community First! Village is much more than a collection of affordable houses. The community includes a medical facility, places for worship and study, walking trails, community gardens, and even an outdoor movie theater. It takes a lot of work to maintain and improve Community First! Village, and that’s where volunteers come in. The MCFI team has helped with a wide range of projects, from working in the community vegetable gardens to digging drainage ditches. Most recently, we laid gravel for a park that will be used for community gatherings and games of horseshoes. The work we do at Community First! Village is always hard and always worth it. One of the things we value most about the experience is getting to work side by side with the residents and hear their stories firsthand. HARTH is a therapeutic horseback riding program based just northwest of Austin in Burnet, Texas. Their goal is to promote healing and recovery for veterans who are experiencing PTSD, depression, anxiety, and other mental health issues. The organization offers free programs to all veterans and active service members, and they rely on volunteers to keep their programs running. MCFI volunteered with HARTH for the first time in December 2017. 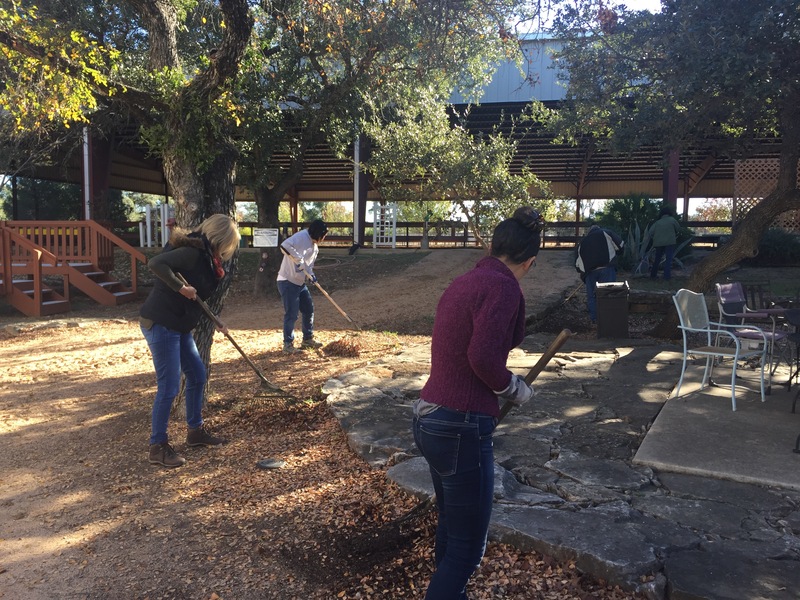 We helped clean the horses’ stalls, laid fresh shavings, painted a handicap mounting ramp, and raked the grounds. After we finished, we had the chance to meet the horses, feed them treats, and groom them. The horses are retired, award-winning jumpers, and it was wonderful to see them being well-cared for and starting a new chapter as therapy animals. When the holidays roll around, the MCFI team takes part in Operation Christmas Child through Samaritan’s Purse. Each employee packs a shoebox with a medium to large “wow” item like a soccer ball or stuffed animal and then fills the box with other fun toys, personal care items, and school supplies. Because these boxes are shipped to children around the world, we further assist the organization by purchasing tracking labels. This helps Samaritan’s Purse reduce shipping costs and raise more money, and as a bonus, it lets us know which regions our shoeboxes are sent to. Compassion International is a Christian organization that helps children living in poverty in 25 countries. They encourage donors to sponsor a child to help them stay in school, get medical care and food, and receive mentoring through their local evangelical church. MCFI has worked on a lot of projects in Latin America, and it’s important for us to give back to the international communities with which we engage. Through Compassion International, we sponsor two young children in Haiti. In addition to making donations, our team keeps in touch with the kids through letters. We’ve loved having the kids ask us questions, send us their drawings, and talk to us about their culture, all with the help of their English-speaking Compassion counselors. 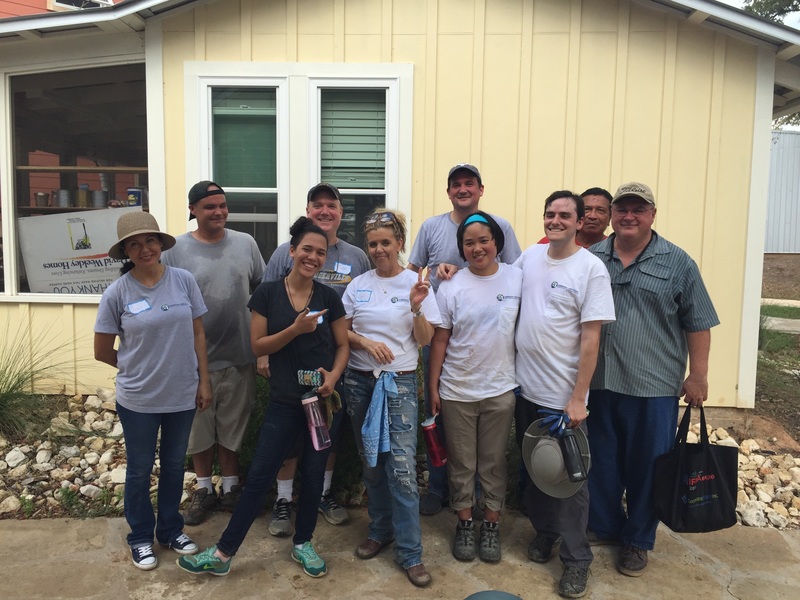 Are you involved with an organization that needs volunteers? We’d love to hear from you and find out if we can get involved.